With the slogan “Apna Vote Apno Ke Liye”, the Muttahida Qaumi Movement-Pakistan (MQM-P) hopes to make an emotional connection with voters as it gears up to retain the provincial constituency, PS-94 in Karachi, in the by-election scheduled for January 27. The seat has been vacant since Muhammad Wajahat, an MQM-P lawmaker, died in November. For the political party, this will be an important win, needed to revivify the political party, which could only secure four parliamentary seats from Karachi, out of 21, in the July general ballot. Back then, MQM-P’s Wajahat easily scooped up the constituency with over 30,000 votes, defeating the Tehreek-e-Labbaik Pakistan (TLP) candidate. The Pakistan Tehreek-e-Insaf (PTI) and Muhajir Quami Movement-H (MQM-H) came in third and fourth, respectively. This time, MQM-P’s main challenger will be the ruling PTI. From the July election to the October by-polls, Karachi, it seems, was the PTI’s to win. The MQM-P, which had ruled the port city for over three decades, was crumbling under the pressure of internal rifts and ended up losing most of its strongholds to Imran Khan’s PTI. The PTI performed just as impressively in the by-polls. But the December local government by-elections shook the PTI’s confidence. It could only manage to win one seat in the ballot, while the MQM-P was victorious on 10 seats. Of the two dozen candidates who have submitted their documents to the election commission, the main contest is expected between the MQM-P, PTI, MQM-H and Pak Sarzameen Party (PSP). The last two are breakaway factions of the MQM. Interestingly, the election commission did not allow the Tehreek-e-Labbaik candidate to contest the PS-94 by-poll. Labbaik has been facing a crackdown by law enforcement agencies across the country after they threatened to shut down cities on the release of Christian woman, Asia Bibi, by the Supreme Court. To date, most of Labbaik’s top leadership has either been imprisoned or is under house arrest. 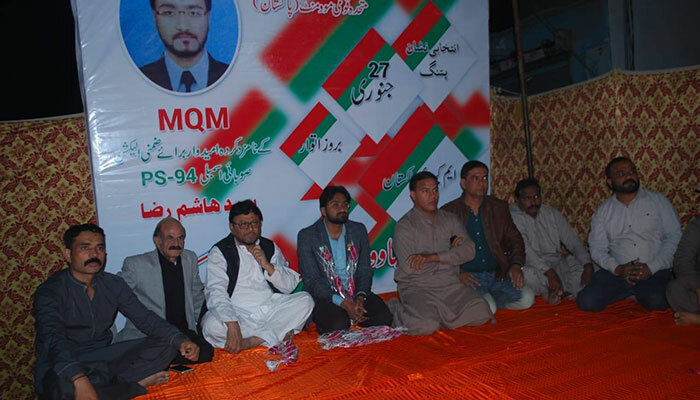 On the ground in PS-94, the MQM-P has helmed a drum-tight campaign. Its candidate, Syed Hashim Raza, is sure of his party’s success. “The PTI does not understand the issues of the area,” he tells Geo.tv. PS-94 is a suburban, middle class neighbourhood in Karachi with a large Mohajir community. On the other side of the ring is PTI’s Ashraf Qureshi, who in July contested from the parliamentary constituency of NA-253 (District Central) and lost to the MQM-P’s candidate, Usama Qadri, with a margin of more than 12,000 votes. A PTI supporter, who asked not to be named, admitted that the party struggles in middle and lower-income areas of the city. “There is a lack of organisational structure, which is why we preform well in affluent areas, such as DHA and Clifton, but cannot appeal to the masses as a whole,” he said. Another reason why the constituency matters to the MQM-P is because the area was once a hotspot of violent clashes between the MQM’s rival factions. Landhi was once among the few Mohajir-populated areas considered strongholds of the MQM-H, since 1992, after it splintered from the MQM. According to journalists, who live in the neighbourhood, the area was a no-go area then for MQM workers. But after a decade of control, the MQM-H began losing its grip on the constituency starting from 2003. The MQM, which was supporting the then-military regime of General Pervez Musharraf, used the government machinery against its rival and demolished its headquarters, Baitul Hamza, in Landhi. It further put two of the MQM-H’s key leaders, Afaq Ahmed and Aamir Khan, behind bars. However, taking advantage of the ongoing operation that started in September 2013, the MQM-H has returned to its former strongholds after a gap of 10 years and could give its arch rival, the MQM-P, a tough contest on January 27. The Tehreek-e-Taliban Pakistan (TTP) is on the backfoot. Nearly 11 years after it was formed by Baitullah Mehsud, the militant outfit is crumbling due to a sustained crackdown by law enforcement agencies, the killing or capture of its high-ranking leaders and an internal rift. Reeling from losses, it is now desperate to re-establish former networks and overcome internal differences. Its frustrations were evident in a document released in late September. The 13-page booklet, titled ‘Strategy for the TTP militants,’ outlines the group’s future plan of action. It includes chapters on possible targets, maal-e-ghanimat (spoils of the war), the use of suicide bombers, the treatment of hostages and spies. Another chapter issues special instructions and aims to provide guidance on overcoming differences of opinion in the Taliban ranks. One of the most prominent faction to break away from the TTP is the Jamaat-ul-Ahrar (JuA), formed by TTP commanders from the Mohmand region in 2014. Soon after its creation, Ahrar too splintered when Mukarram Khan, a militant leader, created Hizbul Ahrar, due to differences with Omar Khalid Khurasani, JuA’s chief. Since then, Hizbul Ahrar has claimed responsibility for several attacks, including the October 3 killing of a police officer in Karachi’s Gulshan-e-Maymar neighbourhood. The factionalism has also led to territorial infighting between rival groups. More and more militants are being targeted and killed after being labelled spies by an opposing outfit, furthering weakening the TTP. The document also suggests revamping the outfit’s organisational structure. Every area will now have its own shura (council) comprising of at least six members. “If six members are not available in a specific area, the decision-making authority of the local chapter would be suspended temporarily.” Moreover, a volunteer will be deputed in each area to keep the central leadership apprised of the happenings. Interestingly, the TTP has amended its previous policy of targeting religious parties. In the new document, it orders its foot soldiers to refrain from attacking leaders from such political parties. However, it allows them to target security agencies, judges, lawyers and pro-government lashkars as well as non-governmental organisations and forces ‘promoting vulgarity’. The TTP is notorious for killing innocent people in public places, such as schools, worship places and playing grounds. But in the booklet, it has urged its suicide fighters to limit civilian casualties. The manual is believed to have been authored by Mufti Noor Wali, who succeeded Mullah Fazlullah in June after the latter was killed in a drone strike. Who will pull the plug on MQM-P and PTI alliance? Cracks within the organisational structure of Muttahida Qaumi Movement-Pakistan (MQM-P) have only grown wider, yet it has managed to push itself into relevance in the country’s national politics. Luckily, it has five seats in the Senate, seven in the national assembly and 20 in the provincial assembly of Sindh. Those numbers make it an attractive alliance partner for the ruling Pakistan Tehreek-e-Insaf (PTI), and came most in handy for the latter during elections for the president and prime minister. But MQM-P has a reputation of not being able to hold together alliances for too long. In 2002 and 2008 the government of the day desperately needed MQM to steady its power bases, hanging by a thread. Then, in 2013, Pakistan Muslim League-Nawaz reached out to it for a coalition prior to the presidential elections. Each one of these unions ended prematurely and in acrimony. The MQM-P, once a juggernaut force in Karachi, Pakistan’s most important metropolis, has won every election in the city in the last three decades through a mix of genuine support from the Mohajir community, a strong local level party structure, and also with the use of violence and coercion. But in the July 25 general election, none of these factors worked. The MQM-P saw a drastic decrease in its share of parliamentary and provincial assembly wins. Interestingly, the party it is now working in tandem with — the PTI — is the same party that it lost most of its strongholds to. For its seven parliamentary seats and support, the MQM-P has been rewarded with two federal ministries—law and justice and IT and telecommunications. It has even signed a nine-point memorandum with Imran Khan’s PTI. One of the opening points of the MoU was to review the Karachi operation, spearheaded by a paramilitary force. But senior law enforcement officials, who asked not to be named, told Geo.tv that the operation will continue as it has till now and any deal cannot scrap it prematurely. Then there are other indications that the alliance will be rupturing, soon after it was pieced together. In a video posted on social media, PTI MNA Fahim Khan and MPAs Raja Azhar and Adeel Ahmed can be seen loudly arguing with Ahmer Ali, the MQM-P-backed vice chairman of Korangi district, in his office over a garbage issue. Regardless, the gains cut both ways. The MQM-P, which could have been pushed into oblivion post the July ballot, is also using PTI to bolster its importance and end its political isolation. “The alliance has provided MQM-P relief and an opportunity to resolve its inner crisis,” explains Dr Tausif Ahmed Khan, a Karachi-based political analyst. “Since Pakistan People’s Party (PPP) hasn’t showed much interest in resolving the civic issues of Karachi, the PTI-MQM-P coalition is likely to help bring development projects from the federal government to the city.” (The PPP holds majority and has formed government in the Sindh province). Syed Aminul Haque, the spokesperson of MQM-P and an MNA, agrees. His party, he says, decided to support PTI because there was no other way to redress the issues faced by the people of urban Sindh. “We believe that the recovery of missing persons, development packages and due resources can only be obtained through a working relationship with the federal government,” he said. Then, there are other rumours in the air. One claim is that the PTI is willing to give the MQM-P a walkover in the by-election, to be held in October, for the NA-243 constituency. The seat has been vacated by Prime Minister Imran Khan. For it, MQM-P is likely to field Faisal Sabzwari. On the other hand, PTI has not nominated any of its prominent leaders to contest the seat. Yet, all of these could be momentary arrangements. In the long run, going by history, political pacts with MQM-P rarely survive. Punjab’s Sikh marriage act: Will other provinces follow suit? Param Jeet Singh is a Sikh businessman living in Jacobabad, Sindh. For him, March 14 was a historic day. Parliamentarians in another province, Punjab, unanimously, and without hesitation, passed the Punjab Sikh Anand Karaj Marriage Act 2018, a law that exclusively regulates family matters of the Sikh community, such as marriages. “This is an important development for us,” explains Singh, “Prior to this, both in India and Pakistan, our marriages were registered under the Hindu Marriage Act, which created complications especially when we moved abroad.” The businessman has a large number of family members who have recently moved from Pakistan to Canada. Over in Pakistan, it is difficult to know exactly how large the Sikh community is, since the recent population census, conducted in 2017, did not list the minority as a separate entity. Instead it was bunched up in the “Others” category. Pakistan’s Punjab government is being lauded for passing a law that repeals the British era Anand Marriage Act 1909, which was never implemented. Now, under the new act, a marriage ceremony or Anand Karaj will be preformed in accordance with religious practices of the Guru Granth Sahib, the Sikh scripture. In recent days, Sikh leaders in Sindh and Khyber Pakhtunkhwa have also started to get together and devise ways to pressurize their governments for a similar law. “The Sikh community in Sindh has already drafted the Sindh Anand Karaj Bill 2018,” says Ramesh Singh Khalsa, leader of the Pakistan Sikh Council. In 2016, the Sindh assembly made into law the Hindu Marriage Bill, which it stated was also applicable to the Sikh and Zoroastrian minorities for the registration of their marriages. But Sikhs opposed the move. Their religious belief, they insisted, is different from that of the Hindu community and the law should be reflective of it. “Clubbing all minorities under one act is like negating their identities,” Khalsa told Geo.tv. The Sikh diaspora in North America and Europe also face problems because they identify themselves as Sikh, but their marriages are registered as that of Hindu, he added. Khalsa has presented a copy of the Sindh Anand Karaj Bill 2018 to Nand Kumar Golkani, a Hindu member of the Sindh assembly, who promised to bring it up for debate in the house. “In Khyber Pakhtunkhwa, the deceased Sikh MPA Soran Singh was also preparing such a bill,” says Khalsa, “But after his killing no one seems to be interested in pursuing the matter anymore.” Sardar Soran Singh was shot dead in 2016, in his native village. At the time of this killing, he was serving as the special assistant to the chief minister of Khyber Pakhtunkhwa on minority affairs. The small, and otherwise ignored, Maula Madad graveyard in the eastern Landhi area of Karachi has had the neighbourhood talking. It is not unusual for residents to see a gathering of police officers descend, unannounced, in the locality. In the past few years this area was teeming with militants. But this time the men in uniforms have set camp near two unmarked graves. The two graves of interest belong to a teenage couple, from the Safi sub-clan of Mohmand tribe. Both were killed mercilessly, by their own kin, on the orders of a tribal Jirga. The event unfolded on the night of August 14. Bakht Jan, 15, daughter of Hikmat Taj, had attempted to run away with her boyfriend, Ghani Rehman, 17, son of Muhammad Afzal. The teenagers did not succeed. The two were soon located and brought back home. That night the two fathers then agreed to have them married. In order to avoid any prospects of revenge from Taj’s family, the boy’s father agreed to hand over two more daughters in Swara, a practice of offering young girls as compensation to settle disputes. Even though both the families had reached an agreement, a Jirga still gathered the next day, during which one elder, Sartaj Khan, insisted that the other members reject the families’ decision and instead pass an order to have the teenagers killed. “They must die for the honour of the tribe and to serve as a lesson for our children,” Khan announced, recalls an onlooker present that day. Khan, like most of the Mohmand tribesmen in Karachi, ran a small business of construction materials in Sherpao Colony, a mile from the graveyard. “He is also a close relative of Omar Khalid Khurasani, which might be why the families were forced to follow his orders,” another participant tells Geo.tv. Khurasani is a notorious commander of a faction of the Tehreek-e-Taliban Pakistan. Recently, Khan’s nephew was picked up by intelligence agencies that suspected his involvement in terrorism related incidents. On the Jirga’s orders, the father and uncle drugged the girl before killing her with electric shocks. The next day the boy’s father did the same. Both the youngsters were buried secretly in the cover of the night. So-called honour killings are not uncommon in Pakistan, which mostly target women who relatives believe have dishonoured the family. Last October, parliamentarians passed the Anti-Honour Killing Bill in an attempt to tackle the crime. Yet this year, to date, there have been 45 cases of honour killings in the country, according to the Human Rights Commission of Pakistan. Four people, including the fathers of the dead couple, have been arrested in Karachi. Khan is still on the run. “According to our information, he was in Buner two weeks ago and now in Rawalpindi with one of his relatives,” another Mohmand community elder told Geo.tv. On Wednesday, the bodies were exhumed for an autopsy under the supervision of a district magistrate and a medical team. The ensuing report confirmed that the couple was electrocuted to death as well as bore marks of torture on the hands, shoulders and legs.